On a quiet morning two years ago, residents of the Danish town of Jyderup awoke to an unusual sight: a military tank driving down their main street. The tank baffled the Danes at first, but then they laughed and cheered and generally acted as if a circus had come to town. A Turkish artist, Koken Ergun, had organized the stunt to make a point: most Westerners have no idea of what it means to wake up to a coup, with tanks rumbling through the streets, TV stations seized and a sense of fear in the air. Yet it is an all too familiar memory in Turkey, which has experienced four coups in the last 60 years carried out by military commanders who see themselves as guardians of the secular order. But the world is fast changing and so, too, is Turkey. For the past eight years, a power struggle has been waged in Turkey between the secular establishment — backed by the military — and the ruling Islamic-rooted Justice and Development Party (AKP), led by Prime Minister Recep Tayyip Erdogan. But although tension has always existed between the two sides, an uneasy truce has kept it in check — until now. On Monday, the country awoke to the seismic news that 49 active and retired military officers, including generals and colonels, had been rounded up in dawn raids and taken in for questioning over allegations they had plotted to overthrow Erdogan’s government shortly after it took power in 2002. Twenty officers have since been formally arrested, ending years of military immunity from civilian prosecution. The arrests are being seen as a critical test of how far the government can go in reining in the military’s power — a goal of Erdogan’s party for years. After it came into power, for instance, the party started using European Union–inspired reforms to pave the way for civilian courts to try military staff. The government has also backed a two-year court investigation into allegations that a bizarre alliance of military men, mafia bosses and secularists sought to create social upheaval by plotting to plant bombs and stage assassinations — all as a pretext for military intervention. Monday’s arrests mark the latest step in these efforts — never before have so many military officers been rounded up by civilian prosecutors, let alone such high-ranking ones. However, that doesn’t mean the power struggle is over or that tensions have subsided. The exact nature of the alleged evidence against the officers, for example, has yet to be made public. 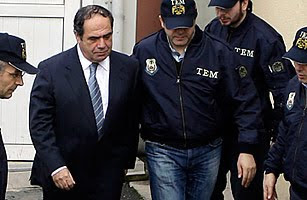 And it’s unclear how the military will respond if the former heads of the air force and navy — both of whom appeared in an Istanbul court Thursday to testify to their involvement in the alleged coup plot — are arrested pending trial. “Turkey is clearly in uncharted territory now and it is very difficult to predict how this crisis could evolve,” Wolfango Piccoli, an analyst for the London-based think tank Eurasia Group, wrote in a report on Wednesday. The situation is further complicated by questions surrounding the motivations of the AKP. Erdogan has yet to answer critics who say that the government’s two-year investigation into the other suspected plotters is partially aimed at settling old political scores against secularist journalists and government opponents who have been rounded up in recent months. “This government has done nothing in the name of democratization except to rein in the military. That’s why I see this process not as one of democratization but of substituting military tutelage with a form of civilian tutelage,” says Cuneyt Ulsever, a liberal columnist for the Hurriyet daily newspaper. The AKP has also controversially shelved plans to broaden Kurdish rights, introduce a more democratic constitution and complete a comprehensive overhaul of the justice system that would make it less vulnerable to intervention, both military and political. The sight of generals in police custody may be momentous to many Turks, but if the government is serious about democratic reforms, it will need to do a lot more to win over its skeptics.